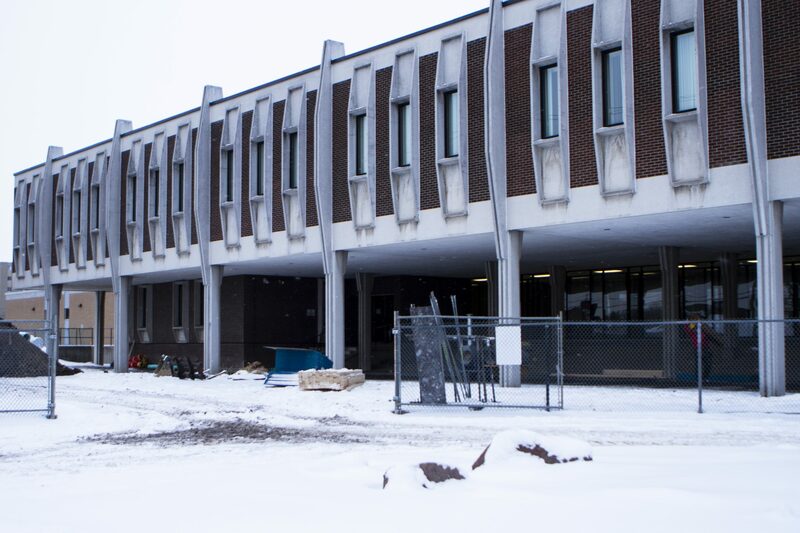 After 58 million dollars and just 18 months of construction, President John W. Tibbits of Conestoga College looks upon the recently finished addition to its campus, named in his honour, admiring 150,000 square feet of pristine Waterloo architecture. In a ceremony held at the new campus on Oct. 18, the college came together in supporting the many contributors who helped make Conestoga College’s newest development possible, and give them a glimpse into the campuses future potential. The new campus is now going to be host to a number of flourishing programs within the college’s educational umbrella: this includes its substantial culinary hospitality, information technology and “language instruction for new Canadians” programs, which will help newcomers to Canada or “nontraditional students” with the goal of language training for employment purposes. Present at the ceremony were members of Cowan Insurance, one of the project’s largest donors at four million dollars, the construction company who put the work into bringing the space to life, GSL Construction, the architects and engineers who helped to orchestrate and give reality to its vision of expansion, as well as members of the board, past board members and its employees. What began in the spring of 2016 would not have been as successful without the support of a number of influential contributors: including the Government of Canada’s Post-Secondary Institutions Strategic Investment Fund, which supported the project with $14 million, the provincial government’s additional two million dollars, as well as two million dollars from the college’s student government. The other $38 million was from the college’s own reserves, so none of the money was borrowed. With its IT program in particular, there are plans to move all of the programs to the Waterloo campus. A number of a new programs have already been added to that campus — and eventually that will be the home of all the IT programming at the college. With enrolment growth this year already around 1500 students, the new campus plans to expand that number by between 2000 and 3000 in the new two or three years, with a current total of 16,500 full-time enrolled students. “The way we’re growing, with rapid technological change, I mean the technology is just changing relentlessly and fierce global competition, we’re going to have to get more and more people into the workforce,” Tibbits said. Conestoga College as a whole can be appropriately described as an “equal opportunity” educational facility — and Tibbits’ description of its goals agrees with that. “The university [for example] draws mainly from the upper socioeconomic quartile, we draw equally from all four: there’s people that maybe they’re unemployed [and] need to find a way back in the workforce [or] maybe they’re underemployed,” Tibbits said. “When I got here years ago, this was not a big ‘foodie’ area, as far as sophisticated restaurants, but the demand for people in the culinary area is quite substantial … [there’s] just a huge shortage in the culinary/hospitality/tourism area … and then the other one I think is quite clear [is] IT in this region,” Tibbits said. When it came to the choice of location, the area on University Avenue in north Waterloo was a simple pick for the college’s new campus. “The primary reason is we have the land. We owned twelve acres of land, we had a place to build and Waterloo is a great location because of the student housing. One of the fastest growing parts of our business is university grads coming in and getting skilled up,” Tibbits said. The main focus of the college, however and one of the main reasons for this expansion, is to meet the demand for the growing workforce that the Waterloo Region is facing, especially in the IT sectors. Moving into the future, Tibbits said the college has plans in the spring to expand one of the wings of its downtown Kitchener campus — estimated currently at a $40 or $50 million project — into downtown Guelph in the next two or three years, as well as growing their accredited engineering school in Cambridge. “We offer a much wider range of programming than universities do and sometimes people don’t understand there’s also very high-level [programs] … what we’re hoping certainly [is] that more Laurier and Waterloo graduates, who aren’t necessarily going onto graduate school, might take a look at the college to compliment their education,” Tibbits said.